• With a maximum concurrent data rate of 1,733 Mbps in the 5 GHz band and 800 Mbps in the 2.4 GHz band (aggregated date rate of 2.5 Gbps), 320 Series Access Points deliver best in-class next-generation .11ac Wi-Fi infrastructure for the highest density environments. • The high performance and high density 802.11ac 320 series supports multi-user MIMO (MU-MIMO) and 4 spatial Access Point streams (4SS). It provides simultaneous data transmission to multiple devices, maximizing data throughput and improving network efficiency. • The 320 series includes the patent-pending enhanced ClientMatch technology that extends the client steering technology with MU-MIMO client awareness. It automatically identifies MU-MIMO capable mobile devices and steers those devices to the closest MU-MIMO capable Aruba access point. By grouping MU-MIMO capable mobile devices together, the network starts taking advantage of the simultaneous transmission to these devices, increasing its overall capacity. These dynamic roaming policies that are based on device types, help customers achieve the best WLAN performance in a mixed device environment during the technology transition period. 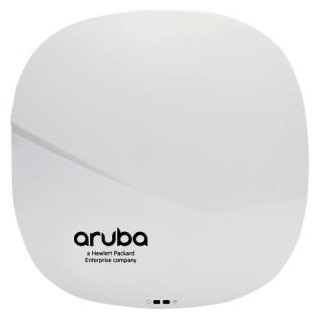 • The 320 series has an integrated Bluetooth Aruba Beacon that simplifies the remote management of a network of large scale battery-powered Aruba beacons while also providing advanced location and indoor way finding, and proximity based push notification capabilities. It enables businesses to leverage mobility context to develop applications that will deliver an enhanced user experience and increase the value of the wireless network for organizations. • Maximum (worst-case) power consumption in idle mode: 8W (PoE) or 7W (DC). • Direct DC source: 48Vdc nominal, +/- 5%. • AP type: Indoor, dual radio, 5 GHz 802.11ac and 2.4 GHz 802.11n 4x4 MIMO. • Software-configurable dual radio supports 5 GHz (Radio 0) and 2.4 GHz (Radio 1). • Four spatial stream SU-MIMO for up to 1,733 Mbps wireless data rate to a single client device. • Three spatial stream MU-MIMO for up to 1,300 Mbps wireless data rate to up to three MU-MIMO capable client devices simultaneously. • Support for up to 256 associated client devices per radio, and up to 16 BSSIDs per radio. • Available channels: Dependent on configured regulatory domain. • Dynamic frequency selection (DFS) optimizes the use of available RF spectrum. • Advanced Cellular Coexistence (ACC) minimizes interference from cellular networks. • Maximum ratio combining (MRC) for improved receiver performance. • Cyclic delay/shift diversity (CDD/CSD) for improved downlink RF performance. • Short guard interval for 20-MHz, 40-MHz and 80-MHz channels. • Space-time block coding (STBC) for increased range and improved reception. • Low-density parity check (LDPC) for high-efficiency error correction and increased throughput. • Transmit beamforming (TxBF) for increased signal reliability and range.